We’d love your help. Let us know what’s wrong with this preview of Keeping Bees with Ashley English by Ashley English. Heard the buzz? Beekeeping is back! Neighborhoods across the country have embraced it as a source of sustainable food and environmental goodness. For those who want to join the "hive" of keepers, Ashley English has the lowdown on the key issues, from space and time considerations to local ordinances to the basics of acquiring, housing, maintaining, and caring for bees year Heard the buzz? Beekeeping is back! Neighborhoods across the country have embraced it as a source of sustainable food and environmental goodness. For those who want to join the "hive" of keepers, Ashley English has the lowdown on the key issues, from space and time considerations to local ordinances to the basics of acquiring, housing, maintaining, and caring for bees year round. Plus, get 10 tested honey-centric recipes! 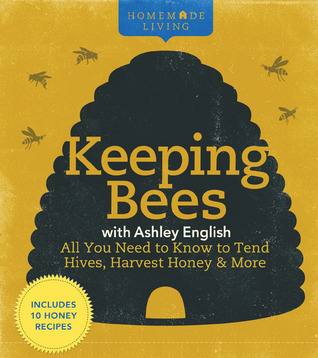 To ask other readers questions about Keeping Bees with Ashley English, please sign up. Beekeeping is hot. It seems that everyone is interested in it – from home gardeners to urban farmers to locavore entrepreneurs these days. Anyone ‘stung’ by the idea of keeping bees will not find a clearer, more useful or better written book about basic beekeeping than Keeping Bees by DIY living expert Ashley English. We have to admit, we’ve been taken with the idea too, with classes taken and suggested texts on the subject feverishly read. But not until reading this wonderful book did the idea s Beekeeping is hot. It seems that everyone is interested in it – from home gardeners to urban farmers to locavore entrepreneurs these days. Anyone ‘stung’ by the idea of keeping bees will not find a clearer, more useful or better written book about basic beekeeping than Keeping Bees by DIY living expert Ashley English. We have to admit, we’ve been taken with the idea too, with classes taken and suggested texts on the subject feverishly read. But not until reading this wonderful book did the idea sink in that we could actually do this. Other well-meaning authors – mostly professional beekeepers, scientists and serious hobbyists, are all too quick to pass by the essentials of the subject and rely too often on insider-jargon. None of them have found the way to explain the life of honey bees, the beauty of beekeeping or the pleasures and challenges of helping these marvelous creatures to help us – all of which English does with an easy, trusted and highly knowledgeable style. Bees are complicated creatures with a short, highly productive lifespan and beekeeping is certainly not something to half-heartedly take up. As with most things in the natural world, actions have results and consequences. Ignorance, mistakes or misguided information can lead to the unintended and readers will find confidence at the hand of English – or least enough confidence to know what questions to ask of a more experienced keeper. A book doesn’t necessarily have to answer all of a reader’s questions but it should not leave a reader with more questions than when they started or without the resources to inquire further. This fact is not lost on English and a great job is done in this tidy, stylish and easy to read book to answer questions and give the resources to learn more. The modern design of the book from cover to cover is appealing and useful – more information is presented in text and in photos combined to great efficiency. English’s clear organization and easy to follow style allows the reader to decide on their own speed of entry into beekeeping as a hobby or profession. Profiles of beekeepers, enthusiasts, chefs, advocates and professional apiarists from around the country dot the book at meaningful moments, adding to the colorful hive-world. The photo-work is especially informative and high quality, a welcome addition to the step-by-step methods for many of the hobby’s functions. The point of honey bee keeping is to help them pollinate the flora in the world around us. By way of cooperation and work, we can receive the benefit of their work in doing so – honey and wax. English covers not only the harvesting and processing of honey (with a number of options as to how best to accomplish this) but includes a number of inspiring recipes using the sweet profits. An up-to-date resource section is included which is far better than such searching the internet – these resources have been reviewed and selected to improve the experience of the reader, a vast improvement on other texts and certainly better than blindly searching the internet. It is a gracious notion that, as Marcus Tullius Cicero was quoted, “If you have a garden and a library, you have everything you need.” A garden without bees is a fruitless, pale reflection of what a garden can be. Let Keeping Bees be your guide to enjoying and gaining from our noble honeybees. A good overview for beginning beekeepers with lots of visual interest (photographs, illustrations, sidebars, profiles of beekeepers). I like "Storey's Guide to Keeping Honey Bees" (Richard Bonney) as a more in-depth source, and "Natural Beekeeping" (Ross Conrad), which has some suggestions for going it without any chemicals. But this is a good starter book. I'll be sharing it with my budding beekeeping buds. Thrilled with this book. Got so adventurous that I actually put my first hive out yesterday. Can't believe it, but I'm doing this! This book was easy to follow step-by-step. We'll see how I feel about this project this fall when I've harvested my first honey. Honestly, I'll never be done with this book as it will be my partner in this new project. Fascinating and helpful primer on beekeeping. Ashley English provides a personal account of her apiary journey including pitfalls and preventions, the biology of Apis mellifera, essential equipment and sourcing, hive placement and care, threats and diseases, and honey extraction. A helpful, easy to understand reference book. I greatly enjoy Ashley English's prose. It is straight-forward with the tiniest touch of whimsy. I also appreciate all of the color photographs in this book. They make a huge difference in my understanding of all things bee related. I've long been fascinated by beekeeping; I don't envision ever owning my own hives, but that doesn't stop me from wanting to know about this hobby. English does an excellent job in laying out the basics of beekeeping, from explaining bee physiology and their caste system to how to build and maintain suitable hives, not to mention harvesting honey. I now have a greater understanding and appreciation of what it means to be a beekeeper. Not exactly ALL you need to know, but a good first start. The lists are helpful when you're trying to remember what you might have forgotten. I feel more comfortable paring this with a more technical book to make sure I'm on track with the bees. It's lovely, though -- the pictures are nice and the book itself is very handsome. I'm glad I read it, but I don't think it's a substitute for a more technical volume. Great book! It definitely whet my appetite for beekeeping. This book gives basic information on the practice of beekeeping in a very appealing way. The pictures are great, and I loved the experiences from beekeepers featured at the end of each chapter often explore the joy they receive from beekeeping. A delightful read, practical but slightly romantic, with the graphic character of a shelter magazine -- strong graphics, sensible layout, interesting sidebars, and a clear voice. I found too many very close parallels to sections of the older Beekeeping for Dummies (Blackiston), with nary an acknowledgement or referral in the "resources" section. This is a really good book for beginning beekeepers. There are plenty of pictures that show you step by step directions. The writing is clear without being weighed down with technical vocabulary or speaking over ones head. The recipes in the back aren't that great looking but I'm so glad I purchased this book. It was an awesome read! Pictures were nice, descriptions well done and easy to understand. It was so explanatory that I realized that bees were not for me! That is what nonfiction book are supposed to do. Give you enough clear information so you are able to make a decision! I finished this book in early October. I love Ashley English's blog (Small Measure) and her series of four "Homemade Living" books (Home Dairy, Home Canning, Beekeeping, Chicken-Keeping) are as well-written and entertaining as her blog. Good how-to sections, great photography and graphic design. Everything you need to know about getting your own hive set-up, tending to it year round, and harvesting honey from them. Includes info on pests and winter keeping, which I found very helpful. Good recipes too, but there are only a handful. Nice presentation, good information and brief profiles of beekeepers in various situations. Fast and easy, yet touches on the important stuff. Another great beekeeping book. I come back to this one for information over and over. This book was super helpful and informative. Reading it was like spending the afternoon with a friend learning about beekeeping. Very quick read and thorough primer. No new information for me, but a lovely presentation and outline. I wish I'd read this as my introductory to beekeeping, rather than the thick Beekeeper's Bible! Cute! Fun! A great book for a beginner beekeeper with lots if insight! Ashley English is the author of the "Homemade Living" book series (Lark Books) which showcases topics related to small-scale homesteading and some of the diverse ways people are reconnecting with their food and food communities and taking up sustainable food practices.